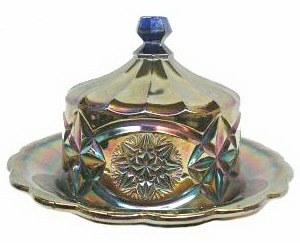 Left - FIRCONE Bowl, Blue, 4.5 in. Bowl. - Riihimaki. 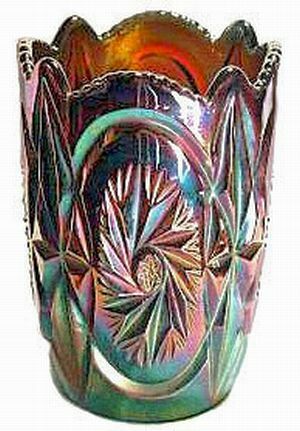 Right - FIRCONE Tumbler - Blue - Courtesy Seeck Auctions. 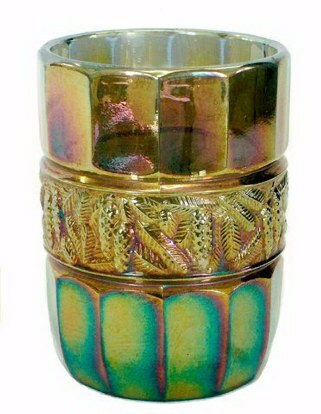 FIRCONE Bowl: Few examples in this pattern have surfaced in U.S. carnival glass auctions. 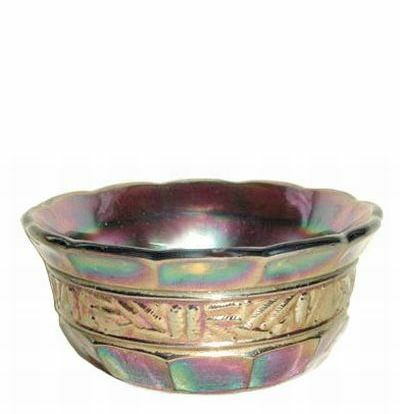 This bowl has seen some use, with resultant wear to the design. Matching blue pitchers are known. STARBURST shapes from Riihimaki Catalog. 5 in. tall - Marigold. 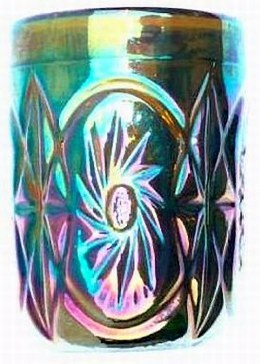 Base design on STARBURST Tumblers-Vase. Cobalt Blue - 5.5 in. tall. 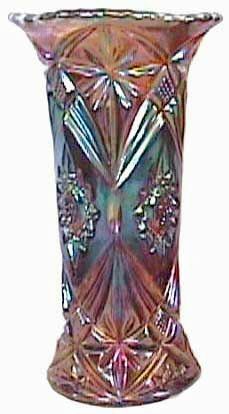 Riihimaki blue ELEKTRA vase 9.50 in. wide x 3.25 in. ground base. TENNESSEE STAR - 7.5 in. tall. Known in. blue, mgld. & amber. 8 diff. shapes in 1939 catalog. 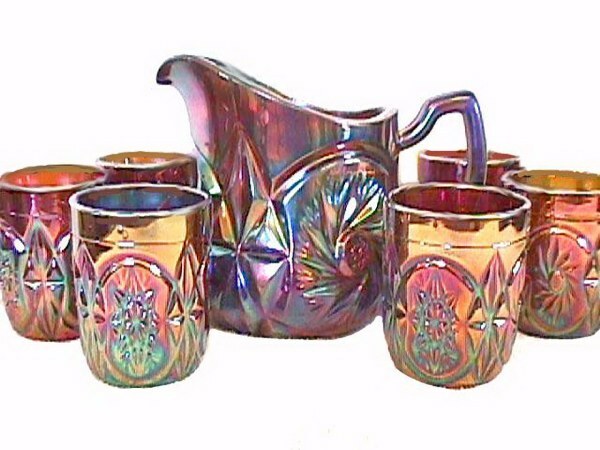 STARBURST, STARBURST and CROWN and TENNESSEE STAR patterns are the focal points of this article, with examples in various colors displayed for your pleasure. Size of the pattern is adjusted to fit the various shapes. 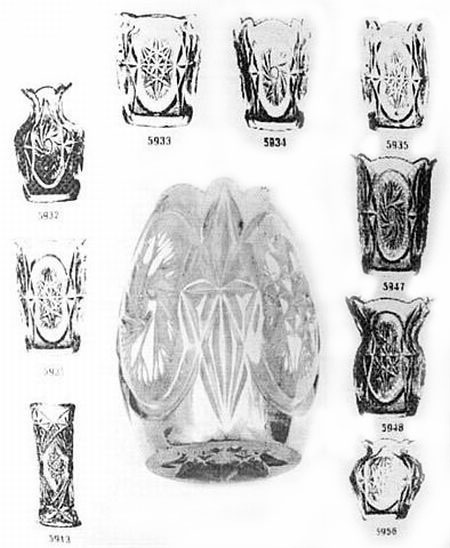 As with most glass from European manufacturers, the thickness of the glass to accommodate the cut designs is a striking influence. 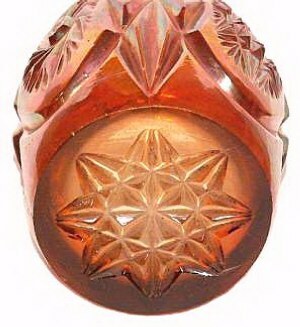 There is an incised star into the base of both the tumbler and the vase shapes. When we lived in San Diego for many years, Galen and Kathi Johnson would come visit us regularly during the early years of their collecting. Galen would arrive in town for a work session on one of the military bases in our area, come for the evening meal and we'd talk glass well into the evening. Many times Kathi could arrange her work schedule for a weekend session in San Diego. The two of them would “shop hop” up and down the coast, arriving for supper and the excitement began over whatever they had “found” that day. 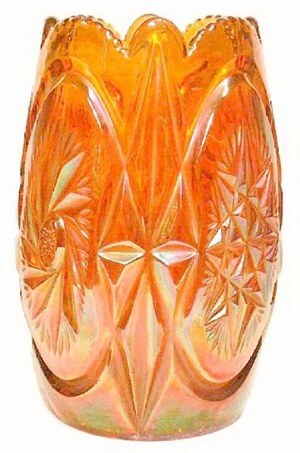 Their discovery of a lovely marigold STARBURST vase made an impression on all of us. Kathi searched in all the books and could not find the pattern. 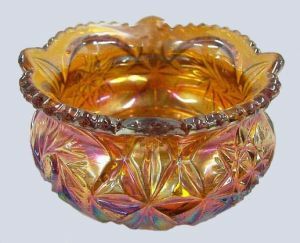 At that time during the mid 1980s, little European glass was available, but nowadays, scarcely an auction in the United States is conducted without several pieces being included. Some examples shown are courtesy Seeck Auctions. 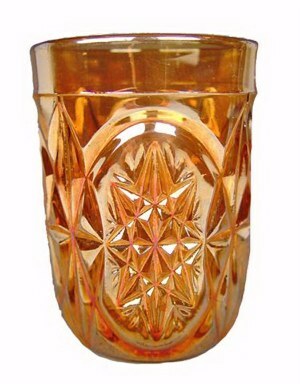 One of four known STARBURST Tumblers in Green. 2 1/8 in. high x 4.5 in. diam. 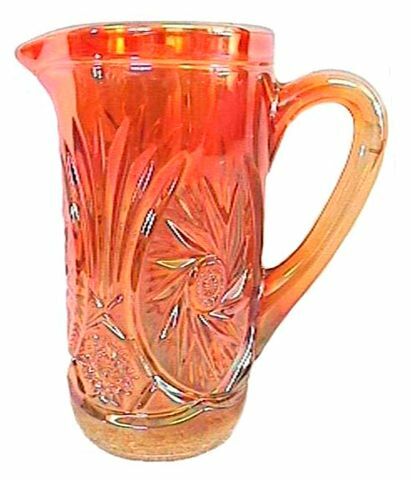 STARBURST & CROWN Pitcher in Marigold.